For about 2,000 years, the Rhine Valley is one of the major traffic routes of Europe. On this natural route between the Mediterranean and the north goods were exchanged, culture was carried on. Already in the Middle Ages the Loreley was a well known place on the right bank of the Rhine. The distinctive rock was a special way mark for the boats on the river. are attracted annually by this fantastic cultural landscape. Hundreds of thousands of these have also visited the Loreley Rock in the last 30 years. and ballet presentations to jazz, rock and folk performances. 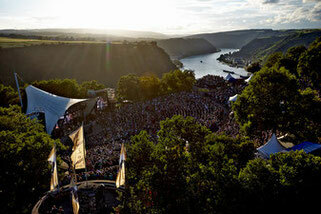 For more than 40 years the Loreley has shown to be the outstanding concert venue for the top acts of international music – if exclusive and protruding tours or grand festivals this stage has convinced everyone, even the most exquisite gourmet of perfect sound. Thus, the outdoor theatre has gained a leading position among the stages with the best sound in Europe. Even rock and metal fans came again and again to enjoy great live experiences like the legendary “WDR Rockpalast” concerts or the “Golden Summer Night” festivals or the “Metal Hammer” Festival in 1985. The World Heritage Site is therefore a challenge for the future of this unique open-air stage.